Your horse might already do something that could be turned into a trick. This is a really good place to start. It is much easier to build on a behavior that your horse already does, rather than starting from scratch. Watch your horse over the next few days and see if there is anything they do that might form the beginning of a new trick. In this video we will give you some ideas to help you discover tricks to teach your horse. It will also get you thinking about the different types of tricks (we really like the useful ones!). So in this video I am using something she likes to do and teaching her to throw a ball TO ME. 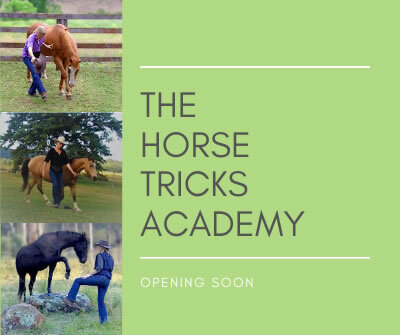 The Horse Tricks Academy is opening soon! Inside the Academy you will find step-by-step instructions and videos to teach your horse simple tricks through to more advanced tricks. Plus you will have access to a community of like-minded people who provide lots of fun and support. We will send you an email as soon as the Academy opens its doors to new members. Looking forward to meeting you and your equines! PS If you have any questions, you can contact us HERE.